Exxon Mobil Corp. reported that it had $7.8 billion of these uncertain tax positions outstanding as of Dec. 31, including $1.5 billion from 2013 alone. Pfizer Inc. reported $6.1 billion, including $1.2 billion from 2013. Google Inc. reported $3.1 billion at the end of September, up from $2.6 billion at the end of 2013. Accounting rules define these tax benefits as ones that tax authorities have strong grounds to reject, by the companies’ own analysis. Seeking those breaks is perfectly legal, and since companies have already lowered their profit numbers as if the taxes had been paid, there’s little risk in rolling the dice. A win down the road will boost profits, while a loss typically does no additional damage. Either way, companies often get to use the disputed cash in the meantime. “It gives a broad indication of which companies are engaging in risky tax behavior,” says Matthew Gardner, executive director of the Institute on Taxation and Economic Policy, a Washington, D.C., nonprofit that produces widely used federal and state tax models and supports progressive tax policies. Few companies give much detail publicly about the tax benefits they’re seeking, but experts say internal transactions that cross national borders and credits for research and development spending underlie many of them. 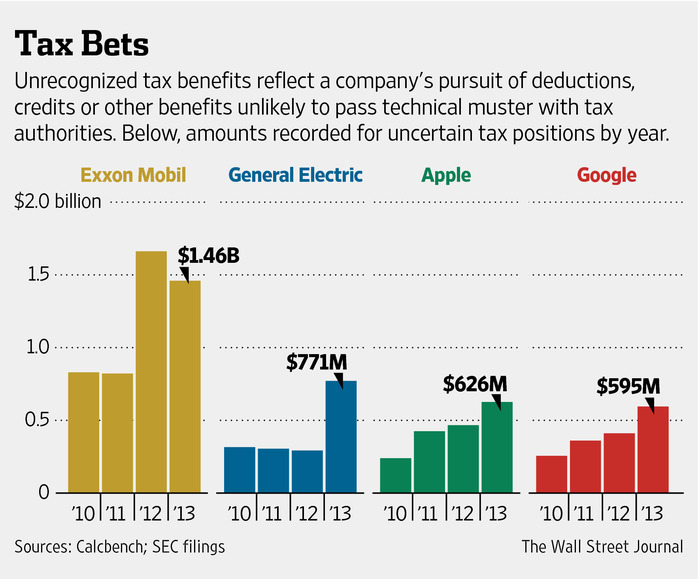 Other uncertain tax benefits boil down to questions of how much of a claimed tax break companies will get or when. Not all big companies have large or rising uncertain tax positions. A fifth of S&P 500 companies added no new uncertain tax positions for last year—among them, General Dynamics Corp., Southwest Airlines Co. and Lockheed Martin Corp. For more than half the companies in the index, the uncertain tax positions added for recent years amounted to a tiny fraction of their overall tax expense. General Dynamics and Lockheed say they work with the IRS ahead of time to address potential problems. A Southwest spokesman declined to comment. But more than a third of the large companies examined by the Journal added uncertain tax benefits faster than they added revenue. At Google, the unrecognized benefits rose 126% between 2010 and 2013, to $2.57 billion, as revenue increased about 104%, company filings show. Valero Energy Corp. nearly tripled its unrecognized tax benefits from 2010 to 2013, when they came in at $950 million, as the refining company’s revenue rose about 70% in the same period. Google declined to comment. Valero’s filings indicate that $556 million of the increase relates to tax refunds the company hopes to collect for blending biofuels into its products since 2005. A Valero spokesman declined to provide additional detail. Factoring in uncertain benefit claims can put companies’ reported tax bills in a new light. Abbott Laboratories reported $138 million of tax expense on pretax income of $2.5 billion in 2013, for an effective tax rate of 5.5%. But the pharmaceuticals company also claimed $244 million in uncertain tax positions for last year, which if upheld would offset its entire tax bill for the year and then some. A spokesman for Abbott Labs declined to comment. Pfizer put its 2013 tax expense at about $4.3 billion. But if the company’s $1.2 billion of new uncertain tax positions for the year pan out, its tax expense might prove to have been closer to $3.1 billion, pulling its effective tax rate of 27.4% down to about 19.9%. “As we mention in our filings, the unrecognized tax benefits relate primarily to issues common among multinational corporations, but we don’t provide a more granular qualitative or quantitative breakdown of these issues,” Pfizer spokeswoman Joan Campion said. She wouldn’t be more specific. By default, large companies pay a 35% tax rate on profits, but many reduce that figure, often significantly, with deductions and credits, among other means. Large profitable companies averaged an effective federal tax rate of about 19% in recent years, ITEP estimates. Exxon Mobil spokesman Scott Silvestri said the company’s unrecognized tax benefits amount to just 6.4% of its total tax expense over the last five years and reflect potential disagreements between the company and tax authorities as far back as 1998, with little potential harm for investors. He added that the company doesn’t expect them to have a material impact on its near-term earnings or effective tax rate. General Electric Co., which reported nearly $6 billion in unrecognized tax benefits at the end of September, is suing the IRS to recoup $658 million in taxes and interest it sought to avoid with the 2003 sale of ERC Life Reinsurance Corp., at the time part of the company’s Employers Re insurance business. The dispute centers on a $2.2 billion capital loss that GE claimed from the sale for tax purposes, a loss that it carried back to offset capital gains from the company’s tax return for 2000. The IRS argued that GE didn’t in fact realize a loss on the sale, because the company improperly accounted for an earlier restructuring. Bets on those breaks or credits pay off if a company can prevail in court, if tax authorities don’t challenge the claims or if the statute of limitations expires—typically after three years for U.S. federal taxes. And companies typically get at least some of what they claim. “We generally end up—almost always—settling issues at amounts less than what we have on reserves,” says Al Cappelloni, a partner with accounting and consulting firm McGladrey LLP’s national tax practice who helps public companies prepare their tax-accounting statements and audits other clients’ tax provisions. Apple Inc. had accumulated $4 billion in uncertain tax breaks through the end of September, nearly double what it reported at the end of 2012. In its Oct. 27 annual report, the iPhone maker said the IRS had completed audits of its tax returns for 2004 through 2009, resolving about $570 million of the uncertain tax benefits. Of that, Apple was able to recognize $166 million, or about 29%. Meantime, the company recorded $882 million in new unrecognized tax benefits for tax positions taken over the course of the year. Sometimes, companies lose. After more than two years of haggling, fertilizer-maker Mosaic Co. struck an agreement with tax officials in the U.S., Canada and the Netherlands on how to tax the company given its internal cross-border transactions. The pact resolved nearly $324 million of tax benefits Mosaic had claimed. At the same time, the settlement led the company to designate as uncertain another $129 million of tax positions taken in prior years. Once Mosaic factored in other consequences of the agreement, it wound up recording an additional $4 million in tax expense during the last seven months of 2013. Mosaic declined to comment on details of the settlement.